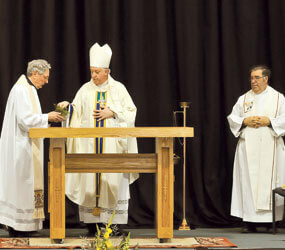 Auxiliary Bishop Mitchell T. Rozanski blessed the new altar at St. Thomas More Academy in Buckeystown March 4, during the school’s first Friday Mass. According to a news release from the independent Catholic school, it was his first visit since it was recognized by the Archdiocese of Baltimore in May 2010. The oak altar was built by the Burns and Grunwell families, whose children attend the school. Norah Burns, a fifth-grader, was among the family members who worked on the altar. Mass concelebrants included Monsignor Richard J. Murphy, pastor of St. John the Evangelist in Frederick, and Father Lawrence Frazier, pastor of St. Joseph-on-Carrollton Manor in Buckeystown. The public is always invited to the school’s first Friday Mass, when students are altar servers, lectors and cantors, and lead the choir. The Mass begins at 10:45 a.m. For more information, call 301-874-9014. Three emergency responders from the Archdiocese of Baltimore were honored by the Maryland State Council of the Knights of Columbus during its annual Community Service Awards presentation and Mass at Our Lady of Perpetual Help Church in Ellicott City March 20. St. Andrew by the Bay Council 11552 in Annapolis produced both the Firefighter and Emergency Medical Technician of the Year, respectively, Anne Arundel County firefighter Phillip Stratton and Anne Arundel firefighter/EMT Scott A. Rodney. Howard County police officer James Zammillo, of St. Francis of Assisi Council 12524 in Fulton, was honored as Law Enforcement Officer of the Year. “We give thanks for these men and women who improve the quality of life here in Maryland,” said Peter Davio, the Knights’ Maryland state deputy. The Mass was celebrated by the state chaplain, Conventual Franciscan Father Donald Grzymski, pastor of St. Clement Mary Hofbauer in Rosedale. The 10-12 girls basketball team from St. Pius X School in Rodgers Forge beat Sacred Heart of Glyndon, 27-8, March 19 to bring the CYO championship back to the school for the first time in 30 years. Coached by David Gately and Joe Clark, the team had a perfect 17-0 record this year. The team included seventh-graders India Myles, Katelin Holt, Peggy Smith, Sara Pugh and Maddie Clark, and sixth-graders Eilish Gately and Kameel Smith. The fifth- and sixth-grade cheerleaders and “The Pius Panther,” as well as faculty, friends and families, were there to support the girls. Coach Gately was a standout player in the 1980s for Mount St. Joseph High School and what is now Loyola University Maryland. Fifth-grader Stephen Hochschild won the annual spelling bee for grades 4-6 at Mother Seton School in Emmitsburg March 15. Second place went to Hallie Mauk, also a fifth-grader. Stephen will now compete in the Archdiocese Spelling Bee May 10 at St. Pius X School in Rodgers Forge.